The Guardian Soul is a Keychain for Sora's Keyblade that appears in Kingdom Hearts II. It is given to Sora by Auron after he defeats Hades and restores Auron's will. 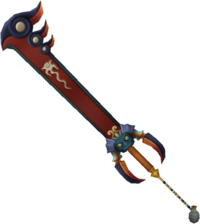 The blade is similar to Auron's strongest weapon in Final Fantasy X, the Masamune. The hilt guard is an ogre-like face, with yellow eyes and fin like extrusions, while the token is Auron's jug of sake. In addition, the sparks that appear when the blade strikes an opponent are Yevon symbols, a reference to the main plot of Final Fantasy X, despite that Auron was instrumental in revealing the sinister truth of the religion. The name references Auron's former occupation as a Guardian for Yuna and Braska in Final Fantasy X. As he was an unsent soul in that game and is a soul in the Underworld in Kingdom Hearts II, the name actually serves as a pun on Auron himself; he is a literal guardian soul. The Guardian Soul can be useful in many situations, as it has a fairly good reach and (with a strength stat of +5) has the roughly third highest strength bonus in the game (while other Keyblades also have +5 strength boost, such as the Sleeping Lion and Rumbling Rose, very few are any higher than this). Furthermore, its Reaction Boost ability increases damage dealt from reaction commands, therefore making such fights like the Master Control Program battle easier. The Guardian Soul is one of the Keyblades packaged with the Series 1 Play Arts Figures Master Form figure. This page was last edited on 2 April 2019, at 00:42.